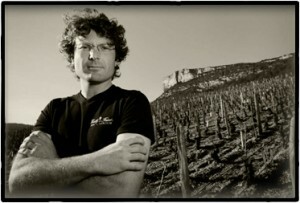 Eric Forest has mere 5 hectares of vines, most of which were planted by his grandfather André in the early 1960s. He spent two years sharpening his style with Macon wunderkind Jean-Marie Guffens before returning to the tiny family holding on the steep limestone scree slopes below the dramatic outcrop of Vergisson to make his first vintage, aged just 24, at the turn of the millennium. A rich understanding of nature and biodynamics, much of it inherited from his grandfather, has informed his approach to viticulture and winemaking. Labour in the vines is entirely manual, with ploughing and hand-hoeing between the rows – the steepness of the slope necessitating the use of a tractor-borne winch in some places – and no use of synthetic herbicides or pesticides. The grapes are carefully hand-picked after being tasted to judge perfect ripeness, and sorted before being delicately pressed in three stages à la Champagne, the must from the beginning and end being set aside to be judiciously added back in as required. Fermentation takes place in barriques and demi-muids, 10-20% of which are new. He also practices the unusual method of allowing the grapes of a few rows to hang into October or even November, then carefully adding tiny amounts of their must, accompanied by the first and only use of battonage, to extend the fermentation and ensure that the yeasts are fully exhausted. The wines are matured for ten to fifteen months on their fine lees before being hand-bottled, usually without filtration. This combination of techniques ensures that only minimal amounts of sulphur, around 25-30 milligrams per litre, are required at bottling. His Macon-Vergisson ‘Sur La Roche’ is planted on soils of decalcified ferrugenious clay with a bedrock of Bajocian limestone. This 400 metre high, north-east exposed vineyard produces wines of great precision and minerality. The Pouilly Fuissé L’Ame Forest is a blend of two complementary, individual vineyards – the clay-limestone combination of Tillers brings finesse and citrus while the marn soil of ‘La Cote’ located on the northern slope of the Vergisson hill brings power and minerality to the structure as well as length in the mouth. The wine is full, rich and intensely mineral, with great length and aging potential. ‘Ame’, incidentally, is a reference to the ‘soul’ of the land, largely planted by his grandfather and now exploited by three successive generations of his family. Pouilly-Fuissé ‘Les Crays’ is on the south face of the imposing Roche du Vergisson, providing excellent exposure to the sun and protecting the vines from the northerly wind, and the wine is intensely citrus and mineral. Eric Forest is a charming and passionate man, with a deep understanding of his region and his terroir, and he makes tiny quantities of Macon Vergisson and Pouilly-Fuissé which are characterised by great precision of flavour. I recommend them wholeheartedly. Culture: Very strict Lutte Raisonnée, no synthetics.